Posted on April 22, 2014 by Worth Stopping By . . . Unfortunately, not everyone likes Brussels sprouts. The sprouts in this recipe (from allrecipes) are placed in a brine for an hour prior to cooking. This reduced the bitterness and seemed to produce beautiful, crispy little cabbages. Timing is everything in this recipe. You will have about 10 minutes from the time that you add the garlic until the Brussels sprouts should be added to the cream sauce. 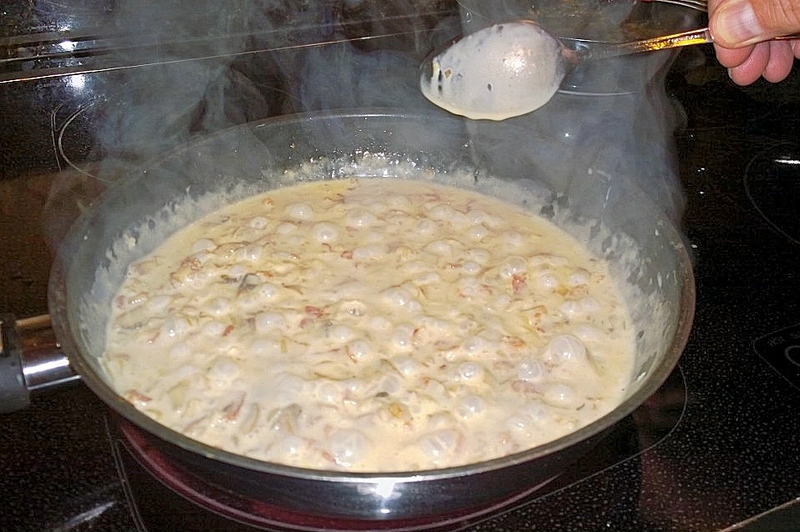 If your sauce gets ahead of you, remove it from the stove top momentarily prior to adding the garlic, sherry, and cream. 1. Put Brussels sprouts in a bowl and cover with water. Dissolve salt in water and soak for 1 hour. Drain off the water, and toss the sprouts in olive oil, sea salt, and black pepper to coat thoroughly. 3. Put the Brussels sprouts, cut sides down, onto a baking sheet, and bake in the preheated oven until the sprouts are browned, about 15 minutes. 4. Reduce heat to medium; stir in the shallot and mushrooms, then cook until the shallots turn translucent, about 5 more minutes. Sprinkle in the garlic, and cook 1 minute, then stir in the sherry and cream until well combined. Bring the mixture to a boil, and stir until reduced by half. The thickened sauce should coat the back of a spoon. 5. Transfer the browned sprouts to the sauce, toss to coat, and season to taste with salt and black pepper.